Graphic representation of a completed panel. Click the stars to see the full panel. The following is reprinted from the July 2005 issue of Stitcher's World (now known as Cross-Stitch and Needlework magazine). Used with permission of the publisher. If you would like to read the follow-up article from the July 2007 issue, a link is provided at the end of this article. When the events of September 11, 2001, occurred, Doreen Lynn Saunders was working for a company at 34th Street and 6th Avenue, a central location in New York City. As a New York area resident, she created and cross-stitched An Americana Flag to honor the victims of 9/11 and to help her get through her initial trauma. Doreen is a graduate of the Fashion Institute of Technology in New York and the author of three books that feature drawings of quilts. In 1976, she was part of a three-person design team that created and constructed a multi-dimensional window display of the bicentennial events taking place in New York City. Since then, she has been working in the apparel and home furnishings industries as a textiles, trimmings, and product designer. In 1999, Doreen discovered cross-stitching as an additional artistic outlet and has been cross-stitching almost exclusively since then. "I have been combining my two loves, quilts and cross-stitching, for several years to develop my signature technique." Explaining the impetus behind An Americana Flag she said, "I never owned an American flag and always wanted one, so I thought what better way to fulfill that desire than to make my own as a tribute." Doreen says the unexpected and extraordinary responses from everyone who has seen her flag, which, at 40" x 24", is almost full size, led her to believe it was necessary to create a follow-up piece "that might help others as my flag has helped me." Now, she has designed The Americana Stars Memorial, a much larger tribute piece that stems from the design elements of An Americana Flag. 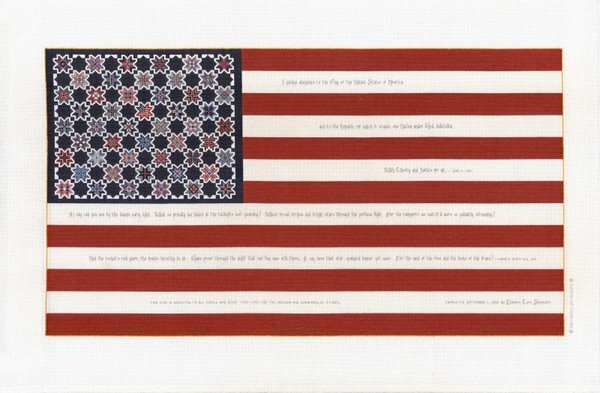 The new piece will honor every victim of 9/11, and will feature more than 3,000 different stars, all of them cross-stitched, each to honor a victim of that day. They will include those of the World Trade Center Towers, the Pentagon, Pennsylvania, the 1993 World Trade Center victims, and Sirius, the electronic detection police dog that was killed on 9/11. Each star will be cross-stitched onto white Aida counted cross-stitch fabric. They will be mounted onto navy blue Aida panels with 64 stars on each panel. Under every star the name of a victim will be cross-stitched into the fabric. In order to accommodate the more than 3,000 stars, Doreen's project will consist of 47-50 panels, each measuring 2.5' x 4'. Stitched across the top of each panel will be American slogans, as well as excerpts from many speeches and songs from our history, including The Pledge of Allegiance, the Star Spangled Banner, and phrases from The Gettysburg Address and The Constitution. "The verses will flow from one panel to the next," she says, "tying the panels together with words." The completed project will be approximately 210' wide. The panels will be arranged in such a way that if you were to see them from above, they will form the letters "U S" for United States, and "us" to include the world. She has been working on this project for about a year and estimates the project will take her two to three more years to complete. The specific idea for the project design came to Doreen as she researched the history of our country's flag for her initial flag design. "The United States of America was the beginning of a country like no other before it," she says. "Its ideals and aspirations were brand new concepts that had never before been attempted in creating a government. As Betsy Ross and our forefathers saw it, the heavens were giving birth to a new constellation and they wanted the rest of the world to see that reflected in the foremost symbol of this new nation. Therefore, the blue union of the flag symbolizes the night sky above and the placement of the stars symbolizes the United States as a new constellation in the heavens." When she first encountered this explanation, Doreen says, "I had goose bumps all over and my mind saw fireworks. It made absolute sense. I feel the victims deserve to be stars in their own constellation in the heavens and I am determined to create that here on earth." Instead of the classic white five-pointed star, Doreen's are based upon an historic quilt element commonly known as the Le Moyne Star. She explains, "The fact that all of the stars are different is to point out the differences between the many cultures that were touched by the losses that day. The fact that all of the stars were created from the same shape is to show how much we should remember what we have in common as human beings." To date, the following companies have donated supplies for the project: Charles Craft--custom-woven and dyed Aida fabric; Robinson-Anton--embroidery floss; Dazor Mfg. Co.--lighted magnifiers; The Warm Company--fusible interfacing; Herrschners® --stitching supplies; and Hobbyware--charting software. Doreen hopes to create an uplifting, colorful, and positive work of art for everyone. "I know there will be many tribute pieces that are based on the depression and angst of the circumstances, so it was especially important to me to create something that offers us hope. Most memorials are created with a grown-up frame of mind. Since so many of the living victims are children, I wanted to give them a memorial that speaks to them first--a memorial that children and adults can experience together without being overwhelmed with sadness." "I want children to be attracted to the many colorful stars, recognizing that each represents a real person. I want them to be able to understand that while this tribute commemorates something very bad that happened to us, they can still always feel optimistic about the future." Doreen said she cannot recall any time as a child or young adult when she was able to appreciate or feel personally involved with a memorial statue or a marble wall. "Because the 9/11 tragedy was so uniquely personal to all of us, I felt we should have a memorial that felt personal as well. Textiles are 'warmer' than concrete, steel, and marble. My Americana Flag commemorates the event; The Americana Stars Memorial commemorates each person who lost their life on that day." "On a personal level," Doreen said, "When I began this project I was not sure what I would do with it. I just knew that because I had been blessed with the artistic ability to create it, I wanted and needed to do so. Even if all of my thousands of stars were to sit in a box and never be exhibited, I would still feel the need and passion to stitch them." The New York Historical Society has requested Doreen's An Americana Flag for display in a future exhibit, and the National Museum of American History of the Smithsonian Institution has requested she donate her flag to the national collections for posterity. She also hopes The Americana Stars Memorial will be exhibited widely, especially at the new World Trade Center, so many will be able to view her work. Doreen with her favorite and only nieces. A personal message from Doreen. "If you would like to find out how you can make a tax-deductible contribution to The Americana Stars Memorial, click the Sponsor-a-Star, Donations, Cafepress and Stitch-a-Star buttons in the left side bar. Thank you"